General Description: Jackson Wellsprings Hot Springs​ is a 30+ acre natural hot springs spa and events center located in southern Oregon in Jackson County. WellSprings boasts hot spring Jacuzzi tubs and a geothermal swimming pool and hot tub. Overnight accommodations include tent camping on spacious tree-shaded lawns, teepee rentals, car camping, and RV sites with full hook-ups. Location: From Grants Pass, Oregon is 40 miles or about 45 minutes to drive to the hot springs. Accessibility: Jackson Wellsprings Hot Springs​ ​is accessible. Open 365 days of the year. You can drive up to the property. The hot springs has a huge property to walk around. This hot springs has limited handicap accessibility. Hot Springs: ​Jackson Wellsprings Hot Springs is a naturally alkaline mineral hot springs from an artesian source. The temperature of the source called "The Mother Pool" is 88 degrees. WellSprings boasts hot spring Jacuzzi tubs and a geothermal swimming pool and hot tub. WellSprings’ Olympic-sized hot spring swimming pool receives 80,000 gallons daily of naturally alkaline, mineral water. The temperature of the mineral water pool is about 70 degrees. The Hot Tub that is connected to the swimming pool is heated to 100 - 104 degrees. This hot spring hideaway also offers a private single Jacuzzi tub and a double Jacuzzi tub. Both tubs are equipped with hot and cold water, enabling clients to select the desired water temperature.​ Clothing is optional in the private Jacuzzi. The mineral water is not treated. The water is pure artesian sourced water. They ask to take a cleansing shower before entering the pools, and frequently thereafter. Clothing is optional in the private hot spring Jacuzzi. Clothing is required during the day and clothing optional at night in the swimming pool and hot tub area. 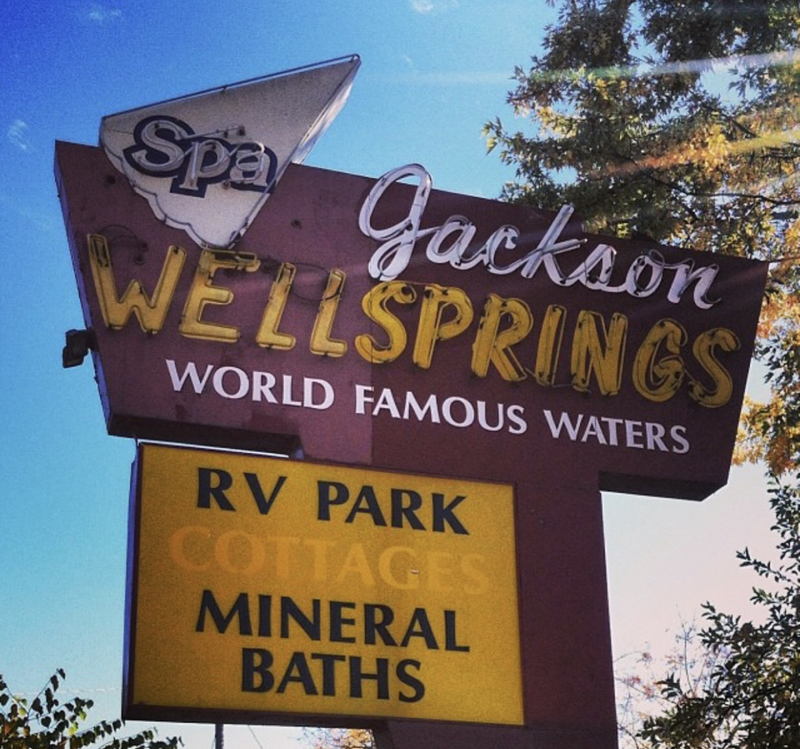 ​​Hot Spring Tips: ​Jackson Wellsprings Hot Springs offers day use for soakers. Guests with accommodations have access to the hot spring pools. Overnight camping includes spa and swimming at no additional cost. Jackson Wellsprings offers tent and RV camping. In the spring and summer they offer teepee, and domes accommodations. This resort offers dining with a cafe and deli service. Jackson is a full service spa that includes massages, body treatments, and facials. This wellspring also has a sauna and steam room along with lockers, changing rooms, bathrooms, and showers. They ask to take a cleansing shower before entering the pools, and frequently thereafter. This resort is pet friendly. No dogs in the hot springs area. Dogs must be leashed. ​ Jackson has a beautiful and extensive garden Their “Tree of Life” garden and vegetable gardens, along with the other Tilth Certified acres, reside under the auspices and protection of the Health Research Institute (HRI). Youtube Video on Jackson Wellsprings Hot Springs is below.